Today, when most GI patients are taking to the internet to research their health conditions, assessing available treatment options, and finding and receiving care, gastroenterology providers like you cannot miss on leveraging these online channels for patient acquisition opportunities. You’ll need to create a more reputable and authoritative presence across all these online channels so that prospective GI patients searching online don’t have to think twice before choosing you as their provider. Constant decline in the reimbursements to GI providers leading to the increased need of acquiring more new patients for filling the revenue gap. There has been a general decline in the reimbursement for gastrointestinal (GI) care services in the light of ever-changing health policies, reforms, and regulations. Revenue cuts aren’t happening only on professional fronts, as in the cases of RVU-based payments, but also on the outside revenue fronts, such as income from outsourced pathology labs. In that scenario, GI providers are looking for ways to improve their patient acquisition to maximize revenue sources for their survival. As a result, the competition for acquiring increased market share has also increased. The growing percentage of tech-savvy patients who rely heavily on online platforms like search engines, review sites, social media, etc., for gathering information and finding a provider. According to CGH (Clinical Gastroenterology and Hepatology) Journal, almost 50% of Americans seek health information online before seeing a physician. 7 out of 10 of these people are also using some form of social media for accessing health information and finding a care provider. Other studies suggest that a significant percentage of the patient population (about 82%) use online reviews to evaluate a doctor before finally selecting them as their provider. All of that points towards the need for a robust online marketing strategy for gastroenterologists. 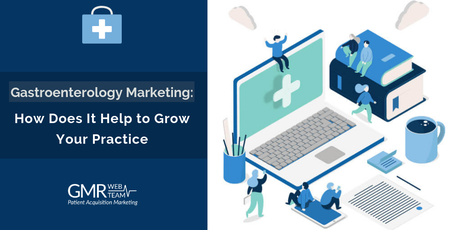 Let’s discuss the different online marketing tools and tactics that can increase patient acquisition opportunities for you. When people don’t have a referral, they search for a gastroenterologist online. This trend has been on the rise in recent times. 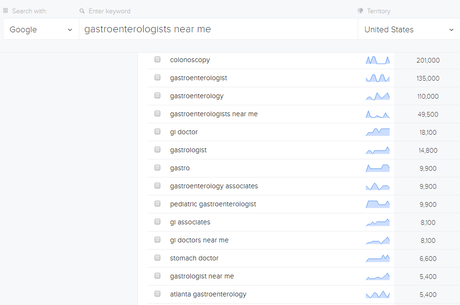 Google registers keywords like “gastroenterologists near me,” “GI doctors near me,” “stomach doctors,” “pediatric gastroenterologist near me,” and “best gastroenterologists near me” in the thousands every month. See the screenshot below. Search engine optimization (SEO) is the organic, non-paid method for inviting more local search traffic to your website. The gastroenterology SEO process starts with identifying all the locally-themed, highly-lucrative keywords that prospective patients use during their searches, and optimizing your website for them. A lot of consistent marketing efforts and activities go into optimizing your site for these keywords; namely, keyword planning, creating thoughtfully-written content, link building, networking with market influencers, etc. All these efforts ensure that whenever a prospective patient from your locality will search for a gastroenterology provider with related keywords, your website will rank on top of the organic search results. Higher website traffic means increased phone calls and more online appointments. While getting ranked for important keywords on Google or getting tons of likes, comments, and/or shares on each post on Facebook is essential, it’s not always guaranteed that these organic methods will deliver the expected results, especially in cases of high-competition. In that case, online advertising channels like PPC (paid online ads), remarketing (which is a component of PPC), and Facebook Ads are the ways to target the right prospects at the right time. GI doctors and surgeons take advantage of these online advertising techniques to instantly reach out to the right prospective patients by bypassing the organic ranking competition. Let’s learn more about the different gastroenterology online advertising methods. If there’s a lot of competition for a given keyword, it may take some time before your website gets ranked through your SEO efforts. 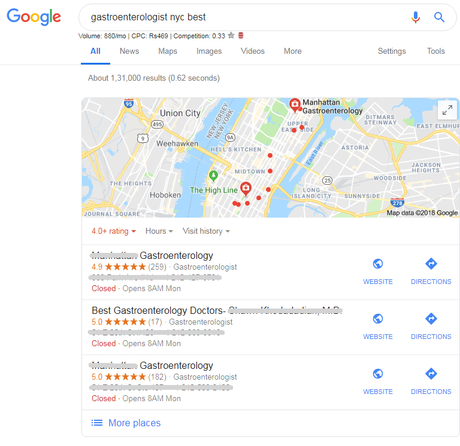 With Gastroenterology PPC, you can bid on relevant keywords to reach the very top of search engine result pages (SERPs)—even above Google’s local organic results (see the screenshot below). The best part about PPC is that you can choose to pay only when a prospective patient clicks on your ads. Google has strict policies when it comes to advertising healthcare services on their platform. Be mindful of language restrictions in your ads. Words like “drugs” and “prescriptions” in your ads will get disapproved. PPC (Pay-Per-Click) is Google’s online advertising channel that lets you run both search ads and display ads. You can opt to get charged only when a user clicks on those ads (that’s why it’s called pay-per-click). PPC advertisements allow you to be highly-specific about targeting the right audience. You can choose the desired geographic location, preferred patient demographics, and the time of the day for targeting. Your ad campaigns are run according to a daily budget that helps it to be cost-effective, and result-oriented. Facebook Ads manager: Like Google, Facebook also lets you show your ads to your target audience through its Ads Manager platform. The targeting options in Facebook are incredibly deep. It allows you to limit your patient audience by age group, gender, location, income level, or even interests and habits on both Facebook and Instagram. Gastroenterology is a highly-competitive segment. This means a lot of GI care providers are battling to gain increased market share. In that scenario, providers who don’t have a reputable presence will lose the battle to their competitors in terms of patient volume. In today’s online world, a reputable presence means lots of 5-star ratings and positive patient reviews across all popular review platforms; including Google, Yelp, Facebook, HealthGrades, Vitals, RateMDs, etc. Most prospective patients (82% of them, according to Software Advice) use these review platforms to evaluate healthcare providers they’re considering. Online reviews are the most significant factor for your online reputation and those GI providers who have the most number of positive reviews across all the review platforms will be chosen by prospective patients. So how do you get those positive patient reviews and build a stellar online reputation from them? The answer is gastroenterology online reputation management (ORM). Screenshot of the header of the testimonials page of one of our gastroenterology clients. This testimonial page automatically collects positive reviews from all review sites helping the page to rank in Google searcheṣ. All reviews are RepuGen verified which means they are used with the permission of patients. Today, at least 70% of GI patients use some form of social media, such as blogs, Facebook, Twitter, YouTube, and LinkedIn for healthcare-related information and searches. They use these platforms to search for information about diseases and treatments, identify providers, and express or rate their satisfaction with providers, clinics or health systems. As a gastroenterology expert, it’s your chance to build an authoritative presence on these platforms and drive higher brand exposure. A misconception that needs to be cleared here is that social media marketing (SMM) is not strictly about driving more patients to your door. Patients who immediately need a gastro-physician or surgeon go directly to Google, and not on social media. SMM is more about network and community building and management with constant patient engagement efforts, such as sharing clinic-related news, replying to common questions from the online community, etc. It’s basically about reaching out to people, building your brand, and showcasing your office culture. So these are the various online marketing techniques that can help your gastroenterology practice acquire more new patients consistently. At GMR Web Team, we are a team of professional gastroenterology marketers who know how to utilize these GI online marketing techniques in an integrated manner to get the most effective results. Call us at 800-523-7187 to learn more.